You can join the upcoming Alzheimer's Association Walk to End Alzheimer’s on Saturday, Sept. 29 at Orange County Great Park in Irvine, or on Saturday, Oct. 6 at Bolsa State Beach in Huntington Beach. This inspiring event calls on participants of all ages and abilities to join the fight against the disease! When you participate in Walk, your fundraising dollars fuel the Alzheimer’s Association mission, and your participation in the event helps to change the level of Alzheimer’s awareness in your community. The Alzheimer’s Association provides free, easy-to-use tools and staff support to help participants reach their fundraising goal. While there is no fee to register, participants are encouraged to fundraise in order to contribute to the cause and raise awareness. Once you register, you will have access to a wide range of tools and support through your customized Participant Center. Join them and lead the way to Alzheimer's first survivor. On Saturday, September 29 Registration is at 8 a.m., ceremony is at 9 a.m. Walk to End Alzheimer's at 9:30 a.m. Orange County Great Park at 6950 Marine Way in Irvine. On Saturday, October 6. Registration at 8 a.m.; Ceremony is at 9 a.m. 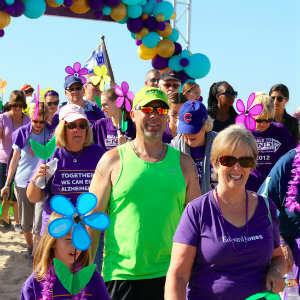 Walk to End Alzheimer's at 9:30 a.m. Bolsa Chica State Beach is at 17851 Pacific Coast Highway in Huntington Beach.